Whether you are responsible for uploading files regularly to a remote web server, or syncing configuration files among a number of machines, most of the time you’ll find yourself using the FTP protocol. But what about automating the process? Could you simply add a shell script to a Crontab job and let it take care of all the FTP login process, file transfers, and essentially has the job done for you while you’re away from your desk? If this sounds interesting, read along. FTP stands for File Transfer Protocol. The protocol specifications were written by Abhay Bhushan. In April 1971, the Request for Comments (RFC) 114 was published to describe the newly developed protocol. 3. Type ftp username@hostname where username is the username used to connect to the server. This will let you jump right into the password prompt. Tip: You can always execute a command on your local machine while in an FTP session with the remote server by prefixing it with an exclamation mark (!). Example: !ls will list the files and directories on your local machine’s current path. 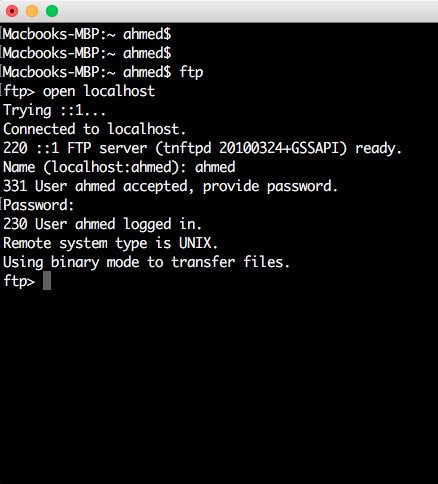 So now you have a basic idea about how to connect to a remote server using FTP, and execute basic commands. Let’s see how you can automate the process. -v: for verbose mode. This is not strictly needed, but it’s good for debugging purposes and troubleshooting. We are going to use a bash feature called “here documents” or heredocs. The main use of this feature is to enable entering multiple lines of input into an interactive prompt. It starts with any string preceded by << (Example <<EOF), then you add the commands line by line, finally you end the block by adding the same string you used, but on a new line and without the << (Example EOF). The idea here is feeding the command with a block of lines and forcing it to treat them as a single argument. So how can this be useful to our FTP automation task? It’s the same concept: FTP is expecting a command as an argument (like user username password), that will be followed by a number of get, put and other FTP commands. Ok now you have all the tools you need to automate an FTP job under your belt, let’s start writing the script. 1. You start by specifying that you are going to use bash as your shell language. 2. Assign the hostname to variable HOST. 3. Assign the username to variable USER. 4. Assign the password to variable PASSWORD. 5. Issue the FTP command in non-interactive, verbose mode, instructing the program not to use auto-login. Also you start a heredocs block to start feeding the FTP program your command block. 6. Enter the user and password. 7. Navigate to the destination directory. Now save this script as ftpScript.sh for example, and add the appropriate permissions by issuing chmod 700 ftpScript.sh. Put this script in a crontab job and you’re done. But do you see any problem in this code? Yes, you guessed right: the password is stored in clear text! Of course you can set very strict permissions on the script so that only you have read access. But imagine you want to change the files you want to upload/download from .html to .php, and while doing so, your new colleague is sitting beside you to learn FTP automation. In such a case, your password will be accidentally visible to your colleague and to any one who happens to have your screen in his/her sight. Ok let’s agree first that the following method is NOT by any means a cryptographically secure way of string encryption. This is just a way to “obfuscate” your password so that it is not visible in clear text. As you can see the base64 representation of your password is UEBzc3cwcmQK. So how can we decrypt it to get back our text? The changed part here is line 4. We used base64 decryption method to get the password string and assign it to the password variable. To make it work, we enclosed the command in to instruct bash to execute the command and not treat it as literal text. This way, if somebody had an accidental look at your file, the base64-encoded password will be much more difficult to memorize than the clear text one. 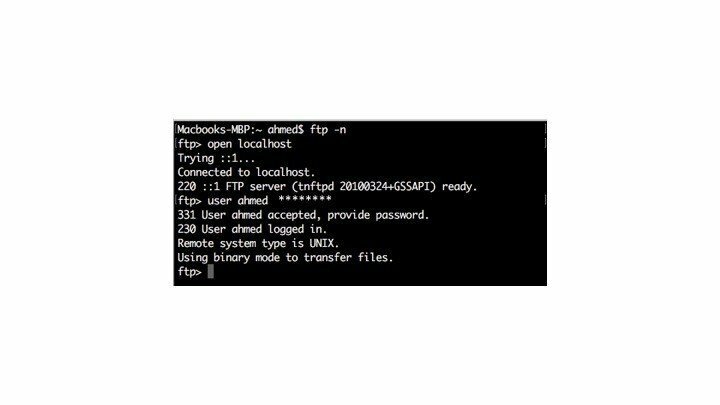 In this article we had a quick overview of the FTP command and how to use it in the bash shell instead of using GUI applications. Then we explained how to use command line switches and heredocs to automate FTP file transfer operations. Finally, we showed a very basic way to encrypt clear text passwords. Although not considered “secure enough” by any security standard, it is much better than letting the password stay in clear text. I hope I saved somebody’s time and effort through this post. Thanks for reading and see you in later posts. base64 is NOT encryption but encoding! What if I need to overwrite existing file on local when downloading?